Venerable Thubten Chonyi, an American nun in the Tibetan Buddhist tradition, will speak on “Belonging: The Connection We All Need” from 6:30 to 8 p.m. Tuesday, April 2, in the Edminster Student Union Building Lake Coeur d’Alene Room on North Idaho College’s main campus. American culture glorifies rugged individualism, yet—deep inside—we all feel the need to belong to a group or community. What does it mean to “belong?” How can we fill that need in a healthy way? Buddhist nun Thubten Chonyi shares on how to connect with ourselves and others in ways that are meaningful and beneficial for all beings. Ven. Chonyi was ordained a Buddhist nun in 2008 at Sravasti Abbey in Newport, Wash., and received a bhikshuni ordination at Fo Guang Shan in Taiwan in 2011. 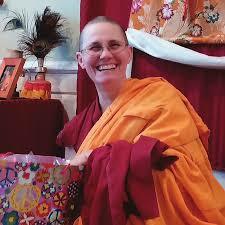 She teaches Buddhism throughout the Northwest and occasionally abroad. Ven. Chonyi co-founded the Coeur d’Alene Dharma Friends. The presentation is free and open to the public, but donations for the abbey are welcome. Attendees are asked to arrive a few minutes early. Information: Laura Templeman at laura.templeman@nic.edu.